THE Department of Climate Change's new six-star energy rated building is 25 per cent more expensive than other Canberra accommodation - with a yearly rent of $6.4 million. 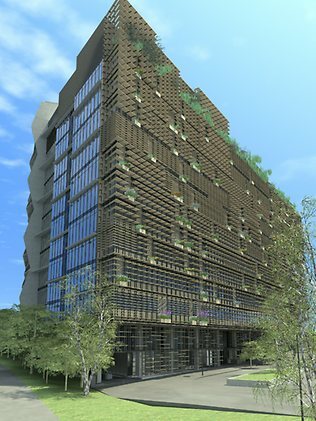 Rent for the "Nishi" building was revealed to parliament, with bureaucrats due to move into the new lakeside green office space at the end of the year. The rent works out at $500/sq m, plus $3500 each for 60 car spaces, and is dramatically higher than other A-grade office buildings outside the Canberra CBD which typically cost just over $400/sq m.
The department asked for $20.5 million to fit out the space, claiming its current accommodation in Constitution Ave was old and of "poor quality, dysfunctional and incapable of economical refurbishment to contemporary standards. Why should this surprise anyone Public Dependants don't live in the real world.Do you know why Canberra was put so far away from anywhere?because when the s--t rises to the surface it still stinks. Has the Green Gillard Government ever shown any sense when it comes to paying out OUR money?